I love the principle idea behind Notgrass Company's Draw to Learn series which is pairing art with Bible devotions. What a fabulous idea! - So simple and beautiful! Our children look forward to their Bible drawing time! So What Exactly is Draw to Learn? 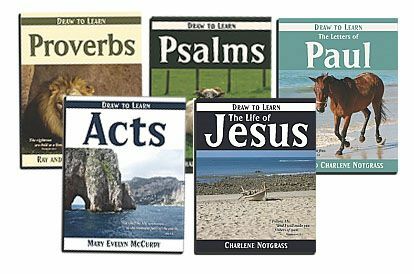 Draw to Learn introduces a Bible passage to be read and a drawing assignment for each lesson. There are 150 lessons per book. (One book will last a full school year.) Each title is available in a consumable, spiral bound book or an e-book format. The first few pages in each of the five books in the Draw to Learn series introduces the foundational idea of Read, Think, Draw. After READing a Bible passage, THINK about it's meaning. THINK about what to DRAW. There is also a section devoted to Suggestions for Drawing the Pictures and another about Expanding this...into a Unit Study. We received one physical copy of Draw to Learn Proverbs. This spiral bound book covers the entire Book of Proverbs and makes for a very nice keepsake. Our nine year old seems to be the most interested in free drawing and spends the most time on drawing projects. So this physical book was given to her to use. For our seven and five year old boys, I printed off copies of the lessons from the Draw to Learn Proverbs e-book and placed their finished work into individual binders as keepsakes. I do believe these will also be treasures for years to come. We received our e-books before the physical copy arrived. So, our first actual lesson with Draw to Learn came from Draw to Learn the Life of Jesus e-book. The license for the e-book allows for as many copies to be printed as you need for your single family's use. All of the books are arranged similarly, and we have enjoyed the lessons from both of the ones we've used. We typically used Draw to Learn lessons in the afternoons. I had originally planned to do these as our morning devotion, but one child may finish in five minutes where another takes more like thirty. So, to keep our morning routine somewhat in check, I moved the lessons to the afternoons. I read aloud the verses and the drawing instructions. We discuss what we've read and then the children are off to work independently on their art. I've found our five year old usually just draws whatever comes to his mind or he may ask for help drawing something specific from the ideas of what to draw at the bottom of each lesson page. He will then color it in on his own. (I did find in the beginning our five year old compared his ability to his older siblings. So, heart issues came to surface in the beginning that we were able to grow from and sweetly resolve.) Our nine and seven year old usually follow the drawing directions. Occasionally they will also draw something totally original, too. A sample of our seven year old's work from Draw to Learn the Life of Jesus. I love his originality. Our nine year old's drawing from the same lesson. Seeing each child's vision amazes me. And our five year old's drawing from the same lesson. He asked to learn how to draw stars and I attempted to teach him. He did a fabulous job! He also dictated a few sentences for me to boarder around his drawing. From Draw to Learn Proverbs: this is one of the rare lessons with the drawing space already filled in. Coloring each letter in a different pattern, with shapes and colors was part of the suggested drawing instruction. This was actually one of Caraline's favorite activities. The boys enjoyed this activity, too. I love having our children focus on the Word of God. They are hiding His Word deep into their hearts while drawing and focusing on the reading sections from the Word. They all enjoy Draw to Learn and look forward to their drawing time each day. This is a valuable activity that we will certainly continue to do in our home. Children (and adults!) can use this study independently if they can read. Any age can use this if the passages and instructions are read aloud to them. The physical books retail for $14.95 each and the e-books are $9.95 each.